Homemade Tzatziki Sauce is the perfect addition to any Greek inspired meal without the guilt. This cream sauce is low fat and low carb packed with bold flavors. Weight Watchers friendly recipe- 0 SmartPoints! A few months ago my husband and I moved from Texas to Indiana. Big move, I know! It’s been a really big and AMAZING year for us… we got married in May and moved a month later. It has been so much fun exploring our new city, creating a new life, and of course, trying new restaurants. One of the first restaurants we went to (in our new city) was a Greek restaurant. My favorite classic Greek meal is a Gyro. 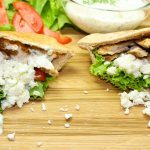 Delicious meat topped with creamy Tzatziki sauce in a pita… mmmmmm! 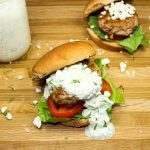 My Homemade Tzatziki is the perfect sauce for any Greek inspired dish. Great as a dip with pita bread, perfect as a salad dressing, or topped on delicious seasoned meat! This is a Weight Watchers friendly recipe and each serving is only Zero SmartPoint! Every time we go to a restaurant, I’m always left full and totally inspired to try and make a guilt free version of whatever I ate. My husband and I really enjoy eating ethnic food… Indian, Mexican, Asian, and Greek. I think we like these cuisines so much because the spices are full of flavor and the dishes are incredibly unique. While I sometimes can’t completely recreate these unique meals at home, I certainly love trying! It’s so much fun experimenting in the kitchen with different ingredients and different flavors, even if the dish doesn’t turn out exactly as planned. If the dish doesn’t quite work out, that just gives me an excuse to go back to the restaurant that inspired me and have the same dish again! Once we got settled in our new home, I had a major craving for that Gyro we had a while back. I knew if I was making Gyros, I HAD to make my own Tzatziki sauce. 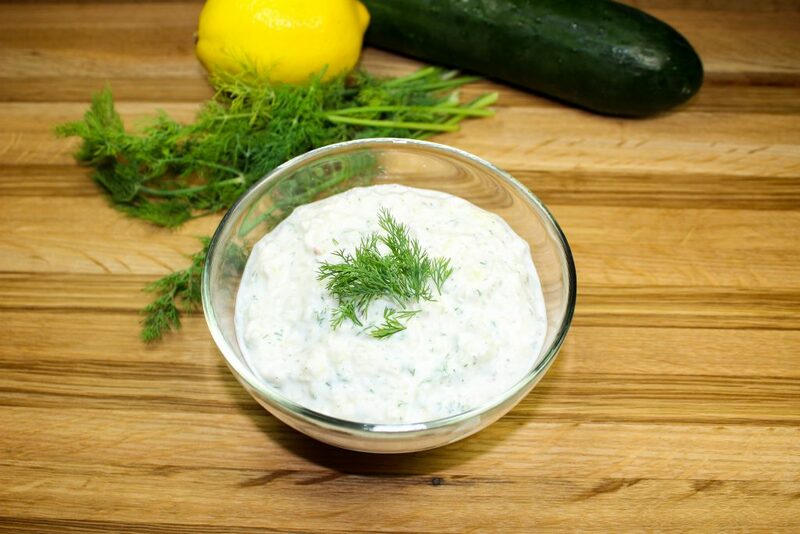 Tzatziki sauce is a creamy yogurt sauce mixed with cucumber and dill. It’s delicious and the perfect topping for a Gyro! The funny thing is that I have liked Tzatziki sauce for years and JUST started to like cucumbers. The cucumber is not super overpowering and neither is the dill. All of the ingredients work so perfectly together to create an amazing sauce that is cool, refreshing, and soooo creamy. 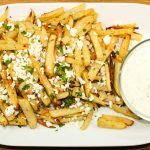 This sauce can easily be made into a guilt free version using fat free Greek yogurt, rather than full fat yogurt. 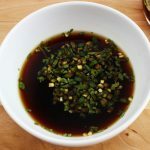 Not only is this sauce easy on your waist line, but it’s simple to make! Once you peel the cucumber, cut it in half and scoop out the seeds. A seedless cucumber would be ideal but sometimes they can be hard to find. After the seeds are removed from the cucumber, finely chop and place into a cheese cloth. Gently squeeze the cloth to remove any excess water from the cucumber. To a bowl, mix the cucumber, fresh minced dill, minced garlic, lemon juice, salt and pepper, Greek yogurt, vinegar, and red pepper flakes (for a little kick). And that’s it! Homemade Tzatziki Sauce is the perfect addition to any Greek inspired meal without the guilt. Low fat and low carb packed with bold flavors. This sauce is creamy and easy to make. Great served as an appetizer with pita bread, used as a salad dressing, or drizzled on top of seasoned meat! Be sure to stay tuned for the Gyro recipe that goes perfect with this sauce! Weight Watchers friendly and zero smartpoints for 1 tablespoon! I hope you enjoy these bites of flavor! Peel cucumber and finely chop. If cucumber has seeds, scoop out seeds and discard. Place diced cucumber in kitchen cloth (or cheese cloth) and strain to remove liquid. Place in large bowl. Finely mince garlic and dill. Add to bowl of cucumber. In the bowl, add lemon juice, lemon zest, salt, pepper, Greek yogurt, white vinegar, and red pepper flakes. Refrigerate at least 1 hour before serving. Tzatziki Sauce can stay fresh in the refrigerator for up to 5 days! Get the latest FREE recipes in our weekly newsletter here. Copyright 2016 - Bites Of Flavor. All Rights Reserved.